Anyone who is familiar with me knows that I have not been the biggest fan of Marvel Studios output. I found The Avengers to be rather tedious with corny dialogue and action scenes that had way too much CGI. In fact my favorite film from the Marvel catalog leading up to The Avengers was Joe Johnston’s Captain America: The First Avenger. With Joe Johnson out and brothers Anthony and Joe Russo (whom I have seen nothing from their filmography on imdb) stepping in to direct I was hesitant if this sequel could capture the old fashioned charm of its predecessor. About fifteen minutes into Captain America: The Winter Soldier my inhibitions went away and I was just sitting back and enjoying the ride. This new Captain America has great action scenes. Unlike most of its Marvel counterparts it does not rely as heavily on computer effects but actually uses real stunts similar to the Christopher Nolan Batman films. I was thoroughly impressed with how much fun the action sequences were. The opening scene where Steve Rogers aka Capt. America, The Black Widow and agents of SHIELD jump from a plane to a ship and take it over, I was hooked. 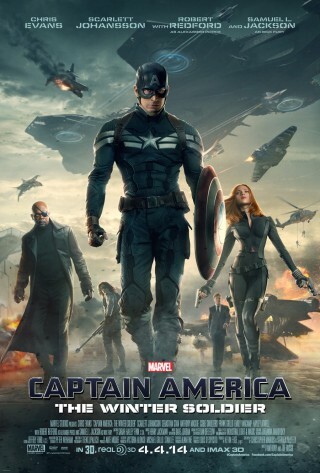 There is also a fantastic shoot out on a highway and the climactic battle in the sky on SHIELD/Hydra war ships were breathtakingly well choreographed, shot and edited that this Captain America has the best action and special effects I have seen since Pacific Rim, although the action in this movie is more similar to The Dark Knight films or Skyfall. It was such a pleasure to just sit back and have fun watching this spectacle. Along with the action being a lot of fun, the acting was great for what it was supposed to be. 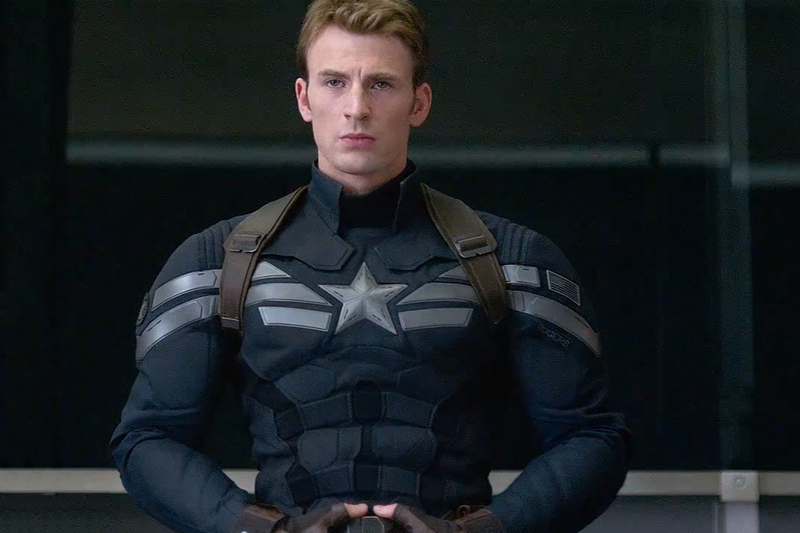 Chris Evans once again plays Captain America/Steve Rogers perfectly as the All-American blue eyed, blonde hair good old hero that he is, I really cannot think of another actor that could have done this role as well as Evans. Scarlett Johansson is given more to do in this film with her Black Widow character than any previous Marvel film and she handles the dramatic scenes and dialogue detailing her past very well. Samuel L. Jackson’s Nick Fury also has more to do than the usual exposition and resolution monologues he has in these films, and of course he is more than capable of handling the extra responsibility. The perpetually underrated Anthony Mackie is great as Falcon/Sam Wilson and it amazes me that after appearing in so many huge films from 8 Mile, to The Hurt Locker to Pain and Gain that he is still not a household name yet. Maybe this will fix that since he has a very important part in one of the biggest and most fun movies of 2014. Even Jenny Agutter, an old favorite actress of mine has important scenes in this film and I loved seeing Garry Shandling briefly reprise his Senator role from Iron Man 2. Plus this might have the best Stan Lee cameo as a security guard at the Smithsonian. 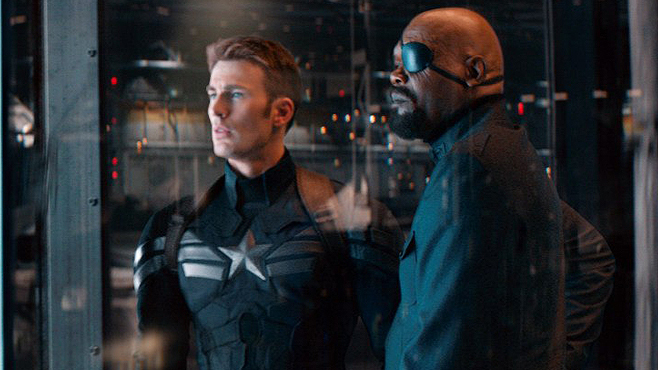 Along with the great acting and action scenes this film is rich with clever details like seeing Captain America in his original uniform and the way he obtains it, and an epitaph on a tombstone involving Samuel L. Jackson/Nick Fury. SPOILER ALERT. SKIP AHEAD TO AVOID KEY PLOT POINTS. The one actor who gave a performance that really stood out was Robert Redford. For the first time I can recall in his long and illustrious career he played a villain. When his evil intentions were revealed in a very cold and menacing scene I was astounded because he has never played an antagonist and in fact has stated in the past he only likes to play heroes with admirable qualities (he once refused to act drunk for a scene in The Natural). So to see him in this type of role was shocking and refreshing and he was cast perfectly against type. After last years All is Lost and now his supporting role in Captain America: The Winter Soldier I really hope that he continues to take these interesting and challenging roles at this stage in his career. I really cannot praise this movie enough. It managed to surprise me and enthrall me for two and a quarter hours. Sebastian Stan returns as Bucky Barnes and is “The Winter Soldier” and maybe he is the weakest acting performance in the film, however it is not entirely his fault since he is supposed to have his memory wiped on a constant basis to keep him as the ideal government/Hydra assassin. 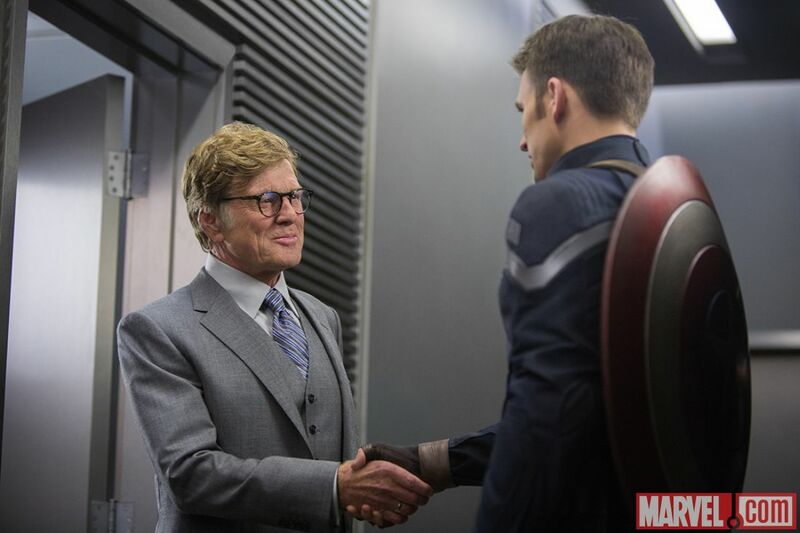 Redford is so cold and calculating as the puppet master who controls The Winter Soldier it really makes up for the fact that Bucky Barnes is an emotionless blank slate. My one criticism of this near perfect, action packed blockbuster movie is the 3-D. There is little to no reason to pay the extra cost to see this on IMAX or any 3-D format. Nothing really stood out as being necessary or amazing by adding the extra dimension, it does not take you to a whole new world like Avatar did nor is it as beautifully detailed and subtle as the 3-D in Hugo. So once again the 3-D is just being used as a studio gimmick to make extra money. I am sure this film would work just as well on a regular screen. That is really my biggest complain and the main reason I am giving Captain America: The Winter Soldier ***1/2 stars instead of 4. So bottom line there is not much to pan and slam in Captain America’s newest adventure. It remains the most consistently superior individual film series from The Averngers. The first one felt like a good, old-fashioned All-American adventure film in the same vein as the first Superman and The Rocketeer. This one has a lot of those same elements but raises the bar with fantastic action, top notch performances and even managed to surprise me with one of the main characters and their intentions. It is a smarter than average Marvel film and an undeniably fun action-thrill ride. I know it was released in April, but I don’t care what the calendar says, this is most likely one of the most fun summer blockbusters you will see this year.